CAKE CUTTING CEREMONY: The cake cutting ceremony is one of the highlights of every event reception. For weddings, it is symbolic of the couple’s first task together, plus it makes a great photo opportunity. Traditionally, the cake cutting ceremony takes place after all the speeches and toasts and before the dances, but wherever this special ceremony is placed in your program, it turns out just as captivating and enlivens the guests’ attention. The couple should know that the more “Love” is seen in the air, the more memorable their wedding. Guests want an assurance from the couple’s display of romance that the couple do not only have friendship but are also in Love. The couple ought to pick a close friend or relative before hand who will help oversee the cake cutting ceremony. Please pick a fun person who will help interject some joy and playfulness into the ceremony. The following is the order in which the ceremony goes: • The MC announces the ceremony making sure that photographers are already on hand to take adequate photos of the cake both before and during the cake cutting ceremony. • The couple proceeds to the cake table with or without an accompanying low level music. At the cake table, there will be a cake knife and server, a dessert plate/platter, 2 glasses, some napkins and forks on request. • The bride picks the cake knife up and places it at the spot on the cake from which they will cut (usually the bottom tier of the cake). The bride places her hand on the knife and the groom places his right hand over the bride’s and together they cut the cake at the overseer’s command. 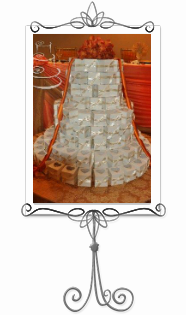 • The bride cuts a piece/slice and places it on the plate or platter. (The feeding of the cake tells a lot about the personality of the couple. Remember to interject some romance, comic or fun in it.) The groom feeds the bride her first bite and then the bride feeds the groom, followed by a good kiss. Some couples like to introduce the Nigerian tradition, by having the bride kneel to feed the groom and then the “good kiss”. All of these signify the couple’s commitment to provide for one another. Remember to express your true emotions for your day so the pictures can capture the real feelings while your guests are reassured that you love one another dearly. As a thoughtful gesture and if you wish, the bride may cut a piece of the cake for her new in-laws and parents too. Usually, the drink toast follows the cake cutting ceremony. The groom pours some drink into the glasses for the couple and the drink toast follows. Having followed this sequence, it is only natural to have the couple’s first dance right after to continue the “Love’s in the air” theme. Once these have been done, the Cake Decorator may take the cake aside where it will be cut up and served to the guests.